The iPhone 7 is here, and with it, a statement about the future of personal audio. Gone is the 3.5mm headphone jack that we've grown used to, replaced instead with a pair of poor-sounding Lightning EarPods and wireless AirPods. It's not really surprising that Apple killed the headphone jack on the iPhone 7. Our future is wireless, with Bluetooth headphones outselling wired ones for the first time this year. Getting rid of the headphone jack also means Apple has more room inside the iPhone to put a bigger camera, battery and its all-new Taptic Engine. There's also one less port for water to penetrate, which is why the iPhone 7 is the first iPhone to have water resistance. Apple removed the iPhone 7's headphone jack to aid water resistance. 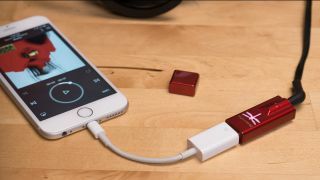 But for Apple to say a digital audio connector, like Lightning and Bluetooth, is better than an analog one is not only unabashed marketing speak, but could potentially be hiding an ulterior motive. Before we address that, though, let's talk about why Apple's wrong to ditch the headphone jack. Bluetooth technology has come a long way and actually sound pretty good. However, wired headphones can – and do – sound better. With wireless headphones, you have to combat interference, which is a constant battle fought inside the headphone. Wireless headphones house both a digital-to-analog converter (DAC) and an amplifier, which means that if either of those are poorly designed, it's going to lead to tons of unwanted noise. Bluetooth technology has come a long way and actually sounds pretty good. However, wired headphones can – and do – sound better. So what does interference sound like? If you've ever listened to a Bluetooth headphone that "hiss" when there's no music playing, it's because of interference. To be fair, wired headphones aren't totally immune to this problem either and can suffer from the dreaded hiss if the DAC and amp inside your phone, tablet, laptop or other audio source are poorly designed. This is much less common with today's modern phones, like the iPhone 6s, Galaxy S7, and of course, the audio-focused LG V20, however. If you look at high-end audio, the headphone jack remains king. Take the $3,500 Ray Samuel's Audio Dark Star headphone amp for example. It features a 6.35mm headphone jack and two balanced analog connectors typically used to connect microphones and other professional audio gear. Even Sony's ridiculous $3,200/€3,300,(about £2,400, AU$4,200) gold walkman still uses the headphone jack. The $3,200 Sony Walkman NW-WM1Z still sports analog headphone jacks. The headphone jack will live on in high-end audio because it just works. It simplifies the connection between an amplifier and your ears, helping to isolate unwanted noise for the best sound quality available. As far as high-end audio is concerned, digital is not always better. But before this turns into a rant against wireless headphones as a whole, let it be said that Bluetooth is getting better with each generation. The aptX Lossless codec is capable of playing back high-res audio at up to 96 kHz sampling rates and sample resolutions of up to 24 bits. It's a good start but audiophiles will likely stick to DACs capable of even higher resolution, like Direct Stream Digital. One of the biggest issues with getting rid of the headphone jack on the iPhone 7 is that it was the last standardized port on the phone. Apple controls its Lightning port via its MFi certification program, which means headphone manufacturers can easily license the Lightning standard, but it also means they'll have to create a non-Apple version for everyone else. Apple controls its Lightning port via its MFi certification program, which means headphone makers can easily license the Lightning standard ... but it also means they'll have to create a non-Apple version for everyone else. Worse, sending audio over a digital port like Lightning could lead to unwanted digital rights management (DRM), closing the analog loophole. Apple has tight controls over the Lightning standard and although it allows headphone makers to use its standard, the company still has final say over how its port is used. "Removing the headphone jack forces people to use a nonstandard manufacturer certified product," said Bragi CEO Nikolaj Hviid. "Through certification, the manufacturer can define and restrict functionality. Thus, when you search for something on Amazon Echo, the result will come from Amazon." Hviid imagines a scenario where all voice assistant inquiries are passed through Siri exclusively. This makes sense as Siri is a defining feature of Apple's wireless AirPod headphones. Getting users to rely on Siri will give Apple a leg up on the competition by locking in users to its ecosystem. Apple's AirPods are a good way to get users to rely on Siri. "Removal of the headphone jack is the first step in a new era of audible search, commerce and entertainment"
"Removal of the headphone jack is the first step in a new era of audible search, commerce and entertainment," continues Hviid. "There are hundreds of billions of dollars in play and the industry's heavyweights all want a seat at the table." The Electronic Frontier Foundation released a statement damning Apple's removal of the headphone jack. "By switching from an analog signal to a digital one, Apple has potentially given itself more control than ever over what people can do with music or other audio content on an iPhone," reads the statement. Audeze's Lightning-enabled Sine headphones feature a DAC and amp in its remote. There are of course limitations of the nearly 140 year-old headphone jack. For one, they can't send data back to the phone beyond analog clicks for music playback controls. With a digital connection like Bluetooth and Lightning, headphones can do a lot more. "Lightning, being a digital connection, allows us to send information easily," said Audeze CEO Sankar Thiagasamudram. "The information being sent back is not just limited to control metadata like next/previous song. But you can send biometric data or noise information for active noise cancellation." The move to wireless headphones is inevitable. They sound good enough and offer the convenience of tangle-free listening. But current wireless headphones still have a long way to go, and the Apple's decision to remove the headphone jack may have been premature. Wireless headphones will need to be recharged, adding yet another device you have to manage battery life for. With wireless earbuds, the problem is exacerbated as you'll have to charge them more often. Apple's AirPods offer just 5 hours of listening, but its carrying case can add up to 25 additional hours of listening. Too bad you can't listen while they charge. You won't be able to use Apple's AirPods while they charge. Then there's the problem of using headphones across multiple devices. Apple's AirPods thankfully still use the Bluetooth standard, meaning it will work with Android phones as well. However, many wireless headphones are meant to be paired to one device at a time. There are few headphones that allow multiple devices to send audio, but a majority of wireless headphones will need to be disconnected and reconnected to different devices. With wired headphones, you just need to plug them in. Apple's MacBook features a USB Type-C port, but not Lightning. Apple may have cited "courage" for the removal of the headphone jack but it's actually another "C" word that motivates the company: control. Lightning-only headphones, like the Apple Earpods included with the iPhone 7, have even more issues since they'll only work with iDevices. You can't even plug them into your MacBook because (surprise) it still uses a 3.5mm headphone jack. Ironically, the MacBook features a USB Type-C port, which is an open standard that competes with Lightning. But here's the kicker: While Apple may have patted itself on the back, citing "courage" for the removal of the headphone jack, it's actually another "C" word that motivates the company: control. iPhone 7 headphone jack: why did Apple drop it?